Just 36 kilometres west of Rockhampton on the Capricorn Highway, in an almost nondescript setting of small shacks and bare ground, the Queensland visitor finds ... thunder eggs. Yes, and they're also known as volcanic birthstones. And you can fossick for them at Mount Hay Gemstone Tourist Park. The Australian Museum describes thunder eggs as spherical objects which form in some types of silica-rich volcanic rocks. Apparently, as lava cooled, trapped steam and other gases formed bubbles, around which silica and feldspar minerals crystallised. In a complex process through the years the bubbles are filled, dry out, shrink, crack, and the cavities filled at various times with banded agate, chalcedony, clear quartz crystals or amethyst. At Mount Hay Gemstone Tourist Park, visitors are able to fossick for thunder eggs through rock and soil carted down from the volcanic slopes. The volcano, subsequently named Mount Hay, has been extinct for millions of years. The thunder eggs in their natural form are ovoid or spherical rocks and it is interesting to see if the fossicked rocks are indeed thunder eggs or just plain rocks rounded out by the elements. The experience is akin to fossicking for opals in Australia's opal fields, such as in South Australia's Coober Pedy or panning for gold in streams running through areas of the Victorian goldfields, such as in Sovereign Hill. But back to Mount Hay Gemstone Tourist Park. Fossicking for thunder eggs at the tourist park is part of an organised tour lasting one to two hours which in 2011 cost $20 per adult, $10 per child and $50 per family of two adults and two children. These prices are subject to change. Tools and other equipment are provided and park staff explain where and what to look for. The area's geological formations are also described and explained. Found thunder eggs are cut free, depending on size. Tour participants are able to view gemstone cutting and polishing operations with semi-precious stones from all over Australia. As part of the tour, visitors are also able to visit the pewter crafting workshops, another activity at Mount Hay Gemstone Tourist Park, and follow the process from raw material to finished pewter product. At the Mount Hay Gemstone Tourist Park gift shop, visitors may browse through and buy — cut and polished thunder eggs and rhyolite slabs, as well as various types of semi-precious stones, and a variety of pewter products. Picnic, barbecue and camping areas are available on site. Camping fees apply for powered and tent sites. 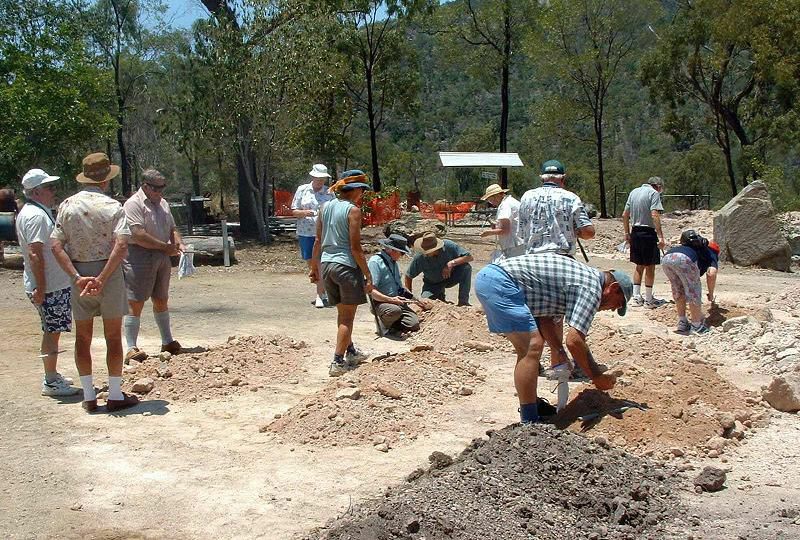 Mount Hay Gemstone Tourist Park is at 3665 Capricorn Highway (A4), Wycarbah, Queensland, Australia 4702, telephone 617-4934-7183, email mthaygems@aradon.com.au. Larry Rivera visited Mount Hay Gemstone Tourist Park as part of a familiarisation tour organised by Tourism Queensland. Which Dublin Church is Home to Saint Valentine?